The Concrete Countertop Institute is your complete resource for concrete countertop success. First and foremost, you’ll have a great training experience and get great customer service. Don’t take our word for it. Hear what students have to say. Our instructor, Jeffrey Girard, P.E., is a licensed professional civil engineer who personally teaches all classes. Jeff will teach you far more than just the basic, oversimplified skills of creating concrete countertops, leaving you ignorant of how things really work. He will educate you on how to utilize different materials and methods and why they work. Workers have skills, bosses have knowledge. This knowledge will give you freedom from problems, freedom to choose your own mix, and freedom to be creative without limits. Build your creativity on a solid technical foundation. Choose your training based on the merits of the knowledge you will gain, not based on how cool the instructor is. The Concrete Countertop Institute does not push products. Our no BS approach helps you find the best materials from the best vendors. We don’t push proprietary products on you. All classes teach inexpensive, versatile, high-performance from-scratch mix designs, and our textbooks include lists of all the equipment and materials you need and where to get them directly from the manufacturer. This means you get the best prices on the best materials and equipment, and the freedom to choose the best sources for you. Our classes are extremely comprehensive, teaching you how to make concrete countertops and also WHY to do it that way. You will completely understand mix designs, reinforcing, sealing, etc. so there is no more trial and error or experimenting. You will have total confidence in your countertops. You are serious about your concrete countertop quality and want to learn from a trusted source, in addition to online forums. You want to minimize mistakes and callbacks, and increase profits. You believe that manufacturing technically superior products that provide long-term performance is key to gaining market dominance and growing your business. You want the freedom to choose your own materials and not be bound to a proprietary mix. You want to understand why concrete countertop construction is done a certain way, not just blindly follow a recipe. You don’t like taking shortcuts, but you do want to avoid the pitfalls. You take pride in producing high quality designs for the most discerning clients. To see what engineering can accomplish, read about some of the high-performance countertops Jeff has designed and taught students to create. With a solid technical foundation, not only will you be more profitable because you have fewer problems, but also you will open up endless possibilities to exercise your own creativity without worries. Training: Even the most experienced person never stops learning. A fresh perspective on concrete countertop techniques and a better understanding of why, through our extremely intensive class for serious pros only, The Ultimate Concrete Countertop Training. A quick, inexpensive way to learn professional GFRC techniques through our Professional Concrete Countertops training. We have many advanced self-study books and videos and online training sessions to add fireplaces, showers, fiber optics and more to your portfolio. Information and networking: You can’t run a successful business in a vacuum. We are dedicated to your education and your success. Learn from The Concrete Countertop Institute, and get the knowledge and confidence you need to succeed. I’d like to give you a little insight into what CCI is all about. I started making concrete countertops back in 1999, when it was virtually unheard-of. All I wanted to do was make concrete countertops for my own kitchen remodel. Lane and I had bought our first house, and it was a 1990s cookie-cutter subdivision house. You know – white cabinets, white laminate countertops, white vinyl floors, white wallpaper with little pink roses – that was the first to go. It was pretty horrid, as you can see. We had grand visions of moving doors, getting new cabinets, etc., then reality set in and we looked at just replacing the floor and redoing the countertops. Those had to be replaced, because the previous owner had cut on them and scratched them, and set a hot pot on them and scorched them. My neighbor gave me a stack of home improvement magazines to help give us ideas, and in one of those magazines was an article about this guy in California named Buddy Rhodes. That was the first time I’d ever seen concrete that wasn’t gray, and it totally blew me away. To engineers, concrete is just numbers and a utilitarian material, but this concrete was beautiful. I had no idea how to color concrete, or to polish concrete, or to make concrete look like that. As I researched how to do this, I found very little information. Remember, back then, there were no books, no videos, no products, just anecdotes on a few discussion boards, from people who had tried it for themselves. All of those stories had something in common. “It turned out nice, but it stained”; “it worked, but the color didn’t turn out”; and, “it came out okay, but it cracked.” They all ended in “but”. I certainly didn’t want a countertop that did that, and I knew I had the background and knowledge to do better. So instead of following the same problematic path, I started from first principles, and applied my engineering knowledge to figure out how to make concrete countertops that didn’t stain or crack, and didn’t require a lot of maintenance. I literally pulled my textbooks off the shelf, created spreadsheets to figure out the mix design and correct reinforcing, and finally, after 8 months, created my first concrete countertop. In the course of doing all this research, I found that there were a handful of concrete countertop companies in major cities like San Francisco, Chicago, New York, Washington D.C., and Atlanta. I thought, maybe there’s an opportunity for this new, upcoming market. So I set up a website, and lo and behold, a few weeks later, I had my first customer. As early as 2000, contractors started asking me, “How do you make concrete countertops that don’t stain and crack?” I started helping a few contractors one-on-one. Then in October 2001, I was invited to the first concrete countertop summit, hosted by Steve Rosenblatt of Sonoma Cast Stone. There were 8 people there, including Buddy Rhodes and Fu Tung Cheng, and Fu Tung showed us a slide show of his book-to-be. That book came out in 2002, and then the interest in concrete countertops exploded. More and more contractors were getting into it, with a variety of success and quality levels. I continued to train one-on-one until I saw that I was just never going to make a dent that way. There were too many people getting into this, and too many instances of clients having bad experiences. I was really afraid the concrete countertop industry would be ruined. So in 2004, I had my first training class, and in the video you can see a class photo from June 24, 2004. That first class, we created a simple concrete countertop, using an all-sand mix. Over the years, I’ve kept up with the latest products and techniques, and carefully adopted the ones that really made an impact on students’ businesses, such as GFRC. I’ve also applied rigorous, quantitative testing to products like sealers and admixtures, to determine whether they really worked and solved a business problem for concrete countertop pros. This has always been my approach – hard data over anecdotal evidence, rigorous testing over casual experience, determining why over just blindly following a recipe or the latest fashion. That is what CCI is all about – learning both the how and the why behind it, so you have a solid foundation of technical knowledge on which to build your creativity. This continues my original mission, the reason I started CCI: to raise the standard for concrete countertops by helping people succeed at them without having so many problems. I wanted to provide knowledge, confidence, and success. Fifteen years later, CCI has trained thousands of people. We’ve provided hands-on training to people in all 50 states, Canada, Mexico, many Caribbean islands, Ireland, England, Scotland, Iceland, Finland, Venezuela, South Africa, Saudi Arabia, India, Thailand, South Korea, New Zealand, Australia, Egypt, Khazakstan, and many more, plus self-study training to many more countries. It has been an absolute privilege to meet so many diverse people, and to influence the concrete countertop industry worldwide. I no longer produce concrete countertops for customers myself. Because I am 100% dedicated to my students, I would rather support them than compete with them. I refer projects to my students, or help students with their projects. By keeping in touch with students all around the world, I see the challenges they face, not just the challenges I faced producing concrete creations in Raleigh, North Carolina. I am so proud of my students’ successes and all the amazing projects they’ve completed. It has been a privilege to be part of the concrete countertop industry’s growth, and my students’ success. CCI provides many ways to learn and grow as a concrete countertop maker – from hands-on classes, to self-study videos, to in-depth mix and product information. I hope to provide you with what you need to achieve knowledge, confidence and success at concrete countertops. Thank you for giving me the opportunity to help you. Jeff Girard is a Civil Engineer who grew up in the cold regions of New England. Even as a teenager, he delighted in taking things apart and putting them back together to see how they worked. This passion for technology and an insatiable curiosity led to a career in engineering. After completing his Master’s degree from UMass in 1993, and getting married to his college sweetheart Lane Mangum, he worked for the Naval Civil Engineering Laboratory in Port Hueneme, California. There he worked on advanced civil engineering projects for the United States Navy. The projects he worked on there (most of which he can’t talk about) trained him in how to find unusual solutions to complicated projects, and gave his immense creativity an outlet. Jeff and Lane moved to Raleigh, NC in the late 90’s, chasing the Dot Com craze. It was there that Jeff first heard of counters that were made from concrete, and decided to try this interior concrete thing for himself. Jeff decided to use a familiar medium in a way he had no experience with, and the rest, as they say, is history. There weren’t any training options a decade ago; in fact, there were no how-to guides at all. To accomplish his mission, Jeff turned to his engineering background, pulling textbooks off the shelf, performing several months of tedious research, testing and design, and basically treating his kitchen project the same way he treated his Navy contracts. If the Navy didn’t fire him, odds were in his favor that his wife wouldn’t either. And, perhaps unsurprisingly, the counters turned out perfectly, and Jeff didn’t have to sleep on the couch for ruining the kitchen. One of the things Jeff realized, as he was diving in-depth into this new branch of concrete formation, was that there was an unmet demand for concrete countertops in his region. So, as a relatively spur of the moment decision, he threw a website together with some photos of his kitchen, and thus FormWorks was born. FormWorks grew into a force to be reckoned with on the national concrete fabrication scene. Jeff’s unique approach, keen eye for detail and craftsmanship and extensive engineering skills made FormWorks into a success. In the early 2000s, as demand grew across the U.S, people began approaching Jeff and asking him to teach them the craft that he’d spent so many hours honing. It wasn’t long before Jeff realized that, even as there was increasing demand for countertops, there was a huge need for qualified professionals to make them. 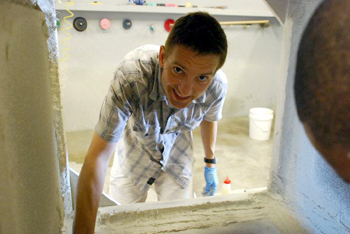 With that understanding in mind, he and Lane created The Concrete Countertop Institute in 2004. Through CCI’s fundamental-based training courses, Jeff is able to share his knowledge and experience with anyone who desires to learn. In 2006, Jeff and Lane expanded CCI’s website into an in-depth resource center which aims to provide information to contractors, homeowners and everyone in between. They also developed membership programs, increased training options, and hit the international market, with students coming in from all parts of the globe. Jeff travels extensively, to do individual trainings, industry seminars and consultations. He is frequently a featured speaker at World of Concrete, StonExpo, and the Concrete Decor Show, and his writing is published in several journals and magazines. At CCI, he does 100% of the training, as well as providing written materials for the self-study courses and manuals. He is an active member of the American Society of Civil Engineers and the American Concrete Institute, and a patron of various museums, as well as an avid fan of fine wine, fresh ground coffee, high end audio and Monty Python. Lane met Jeff in college in New England, and had no idea what a roller coaster her life would turn out to be! A mathematician and computer programmer, she followed the Dot Com dream from California to Raleigh. A native of North Carolina, the transition back to the East Coast was a little challenging after spending several years in perpetually sunny California. She spent the first part of her career as a computer programmer, then transitioned up the ladder to project management, technical product management, and finally product marketing and sales support. When the Dot Com market crashed, and Jeff had started actually getting customers for this crazy concrete countertop business, Lane decided to throw caution to the wind and embark on the adventure with him – making the final transition from software to hardware. With her insights and hard work, she grew the company from a hobby level garage production to a formidable force in the international concrete fabrication scene. Through relationship marketing and relentless networking, Lane was able to make FormWorks into a successful fabrication company. When CCI transitioned to training full time, she was the driving force behind the scenes, implementing her knowledge and skills to develop the marketing books and tools to teach other people in one course what she had to learn the hard way through years of hard work. As VP and General Manager of The Concrete Countertop Institute, Lane is in charge of marketing, sales, event scheduling and overseeing the day-to-day operations of the business. She is also a featured speaker at various conferences and events, and her writing has been published in industry magazines. She is obsessed with the ballet, loves to dance (samba, Latin, ballroom, bellydance, hip hop, techno – you name it! ), and travels extensively to U.S. cities, the Caribbean, Europe and beyond, but most of all she loves to hang out at home base enjoying Raleigh, spending time with her nieces, and chasing after little Pixie and Frankie the miniature dachshunds. Pixie is the smallest member of CCI. Born February 29, 2012, and now weighing in at 14 pounds, this leap year dog is a spunky miniature dachshund with a mischevious streak a mile wide. She’s obsessed with paper towels, sticks and beer bottles (and no, Jeff and Lane don’t let her drink beer)! 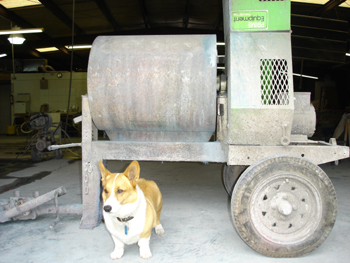 She’s not much of a shop dog, but she does travel well (she fits easily under the seat in an airplane) and has accompanied Jeff and Lane on both business and vacation trips. The students enjoy spoiling her rotten each and every class. Frankie is a recent addition to the family, rescued in 2016 at the age of about 1.5 years. He’s a little deranged, but provides super entertainment for his sister and very loud and overly enthusiastic greetings for the students. We love Frankie despite his foibles, and give him lots of love and walkies. Pippin was a Cardigan Welsh Corgi with little legs but a big heart. He was such a big help with classes and enjoyed getting under foot, under casting table, under mixer… at least he wasn’t a jumper. He loved chewing on sticks, tearing around the dog park with the big dogs, and trying to chase squirrels up trees. We lost Pippin tragically in April 2008, and he can never be replaced, but we are happy to welcome Pixie and Frankie into the CCI family. Every good company needs a good dog or two! Check out the Pippin photos on the CCI Facebook page. Many of our students remember him fondly, and we still miss him dearly.